One of the main reasons I don't play our Wii as much I'd like to has a lot do with movement. This is to say, anything that involves getting off the couch after I've come home from work. I've waved my arms and jumped around enough just getting through the day without having a computer simulation that causes me just as much pain as walking to lunch. But then Ash got me Mario Kart for the Wii with wheel remote and that all changed. 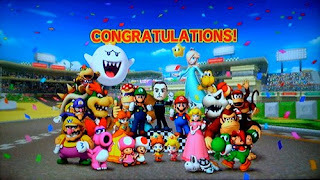 I just finished a record-setting winning streak in which I aced at the very least 15 races in a row. It's now official: I am a pro at the beginner level. Hold your applause. 1) The innate hand-eye coordination that comes complete with associated muscle memory. 2) The universe it creates is out of control fun to look at. Now we just need to get another circular control port for the other controller and it's going down. This American Life: "Devil on My Shoulder"